Perfect for catching the cat litter from my cats box. There still has been some on the floor but much better than before. It works perfect with the cat house I have. ALEKO's cat mat keeps your kitty mess in check and enhances the look of your litter box area. Constructed with an intricately woven mesh design, this mat traps all litter and dirt to prevent tracking throughout your home. Even better, this mat can be cleaned in mere moments; simply give it a shake to remove all debris. Unlike many litter box mats that easily slide out of place and create an even bigger mess, ALEKO's cat mat is weighted and features a no-slip grip around the edges to keep the mat firmly in place. Measuring in at 35 x 23.5 x 0.2 inches, this cat mat is large enough to keep your cat litter area clean, tidy, and contained. Easy cleanup, gray color. Dimensions 35.0 In. X 23.5 In. X 0.2 In. These mats are great to catch litter under the litter box. I place it where the cat has to step on it when coming out. They are easy to clean and catch a lot of litter. This mat is perfect, I have a smaller area where I keep my cat boxes which is in the bottom of a closet, it was too big for the space but perfect to put up on the walls a little bit to keep litter from flying. It's definitely big enough to fit two litter boxes. I have noticed a HUGE difference in the cat liter I'm no longer find throughout my house since purchasing this mat!! The way its made when my cats walk on it its like the mat takes any excess liter off their feet so it doesnt get spread around the house. This is a must buy if you have cats!! The size is PURRFECT for outside the liter box!! This mat is much bigger than I originally thought. I'm glad that I stumbled upon it when I did. My cats are usually pretty active and i'll find litter all over the place but after getting this mat everythings been alot cleaner. 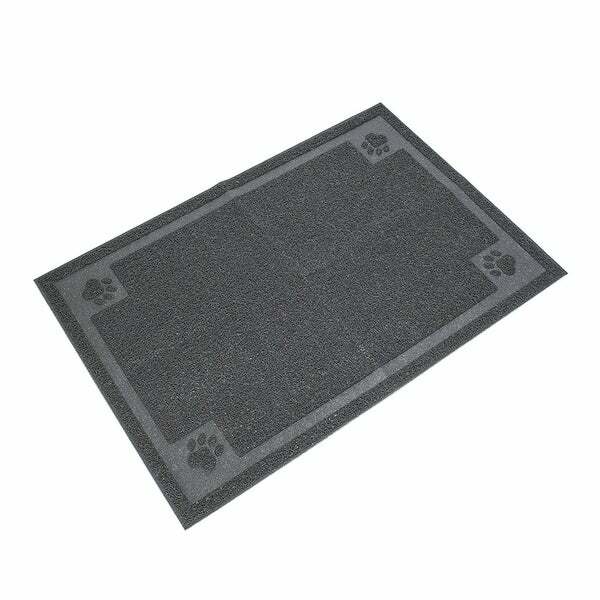 The mat is a great size, I like the grey color along with the paw print design. Coming out of the packaging there is a weird rubber smell... other than that I am happy with the mat. The design is good at catching liter. I needed a mat to catch any kitty litter on my cats paws and the description sounded like be it would fulfill my needs.